Spritz A Little Gold On Summer Fare - Highwood Crossing Foods Ltd.
With words like “terroir,” “bouquet” and a “strong finish on the palate,” one could easily assume Tony Marshall was describing a vintage wine. But he was talking about something much more basic: canola oil. That sunny coloured oil has nudged olive oil from its reigning spot as the go-to pour or spritz for salads and marinades — especially in the summer, when we’re looking for simple and light menus that feature a big salad and a barbecued protein. Simplicity is also the key to canola oil production for Tony and his wife, Penny, the people behind the liquid gold they produce on their 320-acre farm just south of Calgary. Their award-winning, cold-pressed Highwood Crossing canola oil can be found on kitchen countertops across Canada. That includes the kitchen of Calgary’s Charcut restaurant chefs Connie DeSousa and John Jackson, who recently chose Highwood Crossing’s organic canola oils to be among the top 20 artisan foods in Canada. It was part of the Incubator Initiative by Ace Bakery to mark its 20th anniversary. Ace asked chefs across the country to nominate their favourite local food products. Highwood Crossing’s oil was the only product on the list from Alberta. How canola, part of the mustard family, is grown has everything to do with its unique flavour, says Marshall, whose operation also makes flax seed oil and flours. “It starts right with the terroir,” he says referring to the soil and climate which, depending on the year and growing conditions, “will impart different qualities to the seeds.” Each year, just like wines, the canola oil will taste slightly different, depending on the growing conditions. Their canola oil’s unique flavour comes from the fact that it’s certified organic and grows in northern Alberta’s Peace River region. With large farms well separated, there is no “fear of contamination” from other nearby crops. “We let the oil and seed speak for itself,” says Marshall. Processing is kept simple by controlling the temperature at which the canola is pressed, the amount of oxidization and exposure to light. The oils are bottled in dark glass to prevent it from breaking down. “People are amazed by the vibrant colour, then the incredible bouquet. It smells like a freshly mowed field of hay,” says Marshall. But Highwood Crossing’s artisan oils are just a small part of this large industry in Alberta and Canada. Many of us have driven by dazzling yellow fields in our summer travels around the province, where 15,000 farmers grow canola, states the Alberta Canola Producers Commission. It’s a big industry in the province and in Canada, producing $7.3 billion in cash receipts nationally in 2011 — with $2.6 billion of that in Alberta. And 85 per cent of Canadian canola is exported as seed, oil and meal. Cory Welsch, chef at Moriarty’s Wine & Bistro Bar in Edmonton, is effusive about the Mighty Trio oils produced in Redwater, northeast of Edmonton. After finding the product at the Old Strathona Market in Edmonton, Welsch found it has become his go-to cooking oil. Welsch uses it for everything from marinades (see recipe at right) to baking as a replacement for butter. 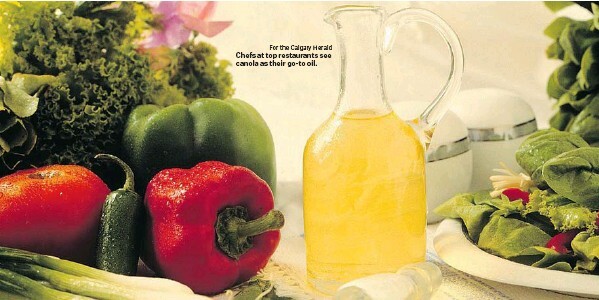 He’ll also drizzle the oil on some dishes as a finishing touch, just to give it colour. As much as it is about the flavour of canola oil, so too is it about its healthfulness. Studies have consistently found that canola oil is good for you. Benefits include the fact that it contains high levels of monounsaturated fatty acids, known to reduce blood cholesterol levels, essential omega-3s, which can help prevent heart attacks and strokes, and omega-6s, vital for brain development in infants. It’s also a good source of vitamin E.